When the Archive Folder is enabled, deleted Folders and Entries will be archived into the Archive Folder. Items in the Archive Folder can be reviewed, retained, Restored to their original locations, or can be Permanently Deleted. Only administrators and permitted users will have access to the Archive Folder items. Web client: Right-click a Folder or Entry > Select "Delete" > Unselect option "Delete Permanently". KeePass/Mobile clients: Deleting an item normally will send the item to Archive if it is enabled and allowed. 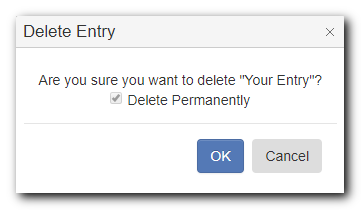 To delete an item: Right-click a Folder or Entry > Select "Delete" > Select option "Delete Permanently". 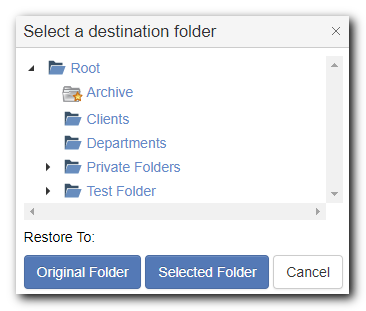 To restore an item: Right-click a Folder or Entry > Select "Restore" > Select a destination Folder. To use this feature, a user only requires the ability to see the Archive Folder. Since Archive is inherited from the Root folder, by default all users / roles with access on Root will have access to this folder. Disabling the Archive Folder will stop deletes from being archived. The current Archive folder will be retained in place with all the presently archived entries in folders. Now the administrator & permitted users can manage it as a regular folder. Note: Enabling Archive functionality again, will create a new Archive system folder. It is possible to delete the folder, and all its contents, by first Disabling the Archive functionality.